My mother was our household's first gamer. She had me young and stayed home to raise me, and one of her favorite ways to kick back was to play videogames. Our first systems were an Atari 2600 and ColecoVision, and Mom would spend hours on Centipede, Ms. Pac-Man and Q*bert. Eventually, as any toddler would, I became curious about the bright objects and beeps coming from the TV and took an interest in games, too. That was 1982, which was also the year my mother was diagnosed with Multiple Sclerosis. We played together when I was growing up; everything from platformers and trivia games to adventure and puzzle games. Mom bought a SNES for my birthday one year, and many a Mario-filled evening was had between us. Eventually, I got a Nintendo 64. We played as usual at first, but the new controller presented a challenge for her. It was much bulkier than what she was used to, and holding one made my mom's hands get tired quickly, a problem she hadn't had before. This was my introduction to just how even a sedentary activity like gaming can be limited by a person's disability. According to the IGDA Game Accessibility SIG, approximately 23 percent of Americans have some sort of disability. These fall into several different categories, the main ones being visual, hearing impairment, mobility and cognitive disabilities. My mother's case is one of mobility issues, so when she's deciding which console to buy, she has to consider the control scheme in addition to factors like price and game selection. Compared to the NES controller, or even the SNES one, the N64 controller was a completely new animal, with its 10 buttons, analog stick and D-pad, and three-pronged shape that demanded a rigid two-handed grip. The Z-trigger, located on the lower front of the center prong, and the analog stick were particularly troublesome for her. We kept the SNES hooked up so she could still play the older games. At the time, I never thought of my mom's problem in technical terms. I just knew she couldn't handle the new console. 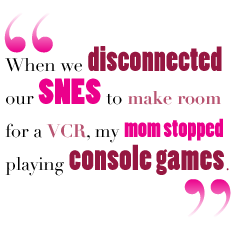 When we disconnected our SNES to make room for a VCR, my mom stopped playing console games. However, she still plays a lot of games on the PC, which has become a refuge for gamers with disabilities. Various developers and researchers are creating games specifically designed with disabled people's needs in mind. Some mainstream games are beginning to think of accessibility, too. PopCap's Peggle Deluxe includes a "Colorblind Mode," which places a symbol on each peg to identify its color. With their proprietary designs, consoles seem to hinder universal accessibility development. It was difficult to find features like Peggle's in console games. These options, when they do exist, are not always so high profile. According to the Accessibility SIG, many developers tend to focus on addressing one particular type of disability, with visual and auditory considerations leading the pack. Grand Theft Auto: San Andreas is one game that features not only a full caption option for cut-scenes, but they're also available for review at any time. For someone who's hearing impaired or unable to follow the game at its normal pace, these are invaluable. PokÃ©mon titles feature text speed adjustment, a feature that could assist a child learning to read or a dyslexic who struggles with deciphering information.